The keyboards on your iPad mini became even more useful with the arrival of iOS 8. Now the keyboard takes an educated stab at the next word you mean to type and presents what it surmises to be the best possible word choices front and center. Say you’re in the Messages app and the last message you received was an invitation to lunch or dinner. Above the row of keys on the iPad keyboard, you’d see buttons with three word suggestions: Dinner, Lunch, and Not sure. If one of those were the appropriate response, you could tap the button to insert its text into your reply. If you wanted to respond with something different than the three options presented by Apple, you’d just type your response with the regular QWERTY keys. As you type additional letters and words, the three suggested word choices above the keyboard change in real time. For instance, if you start by typing That is a in your message, the new trio of word choice buttons that show up might be good, great, and very. 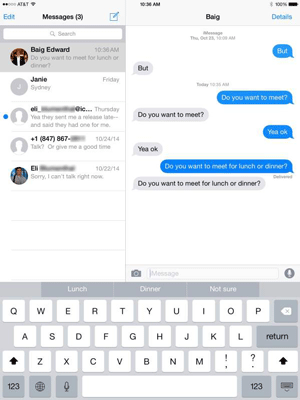 Such QuickType keyboard predictions vary by app and even according to the person with whom you are communicating. So the predictive text choices that show up in Messages when you’re involved in an exchange with a friend are likely to be more casual than those in an email to your boss. To exploit the predictive typing feature, make sure the Predictive setting is turned on (as it is by default). Go to Settings→General→Keyboard, and slide the Predictive switch to on. Such suggestions don’t appear only in English. If you’re using an international keyboard, suggestions are presented in the appropriate language.